Atempo will be at the NAB Show 2019 in Las Vegas 8th to 11th April. It will be the occasion to meet current and future customers and to showcase the powerful Miria for Backup and Miria for Archiving platforms for large unstructured data sets. Miria is fully compatible with industry MAMs and handles data movement securely to vendor-agnostic storage destinations of your choice. Atempo recently reaffirmed their alliance with Canada's National Film Board (NFB) a valued customer and technical partner since 2009. The two organizations have committed to working together for the next ten years on a number of innovative technological projects the Miria platform. Jimmy Fournier, NFB's Director of R&D Director will be present at NAB and he will be a regular presence on Atempo's booth (#SL8824). Atempo has worked closely with Qumulo on their Data Migration Service for customers wishing to migrate data from legacy storage to Qumulo with zero downtime and zero data loss. Atempo has a speaking slot on Qumuo's booth (#SL12111) at NAB this year. Mike Oakes, a Senior Atempo Pre-Sales Engineer will be giving a presentation on the subject of data migration on Tuesday, April 9th at 3pm and Wednesday, April 10th at 5:30pm. More on Qumuo's Data Migration Service here! “Le Labo” in Paris chose Atempo to store and share large data volumes between many film and TV editing workstations. For this, Le Labo uses Atempo Miria daily. "ENVY" in London provide their customers with dedicated tapes of their entire video production. Current output stands at 4 PB per year. 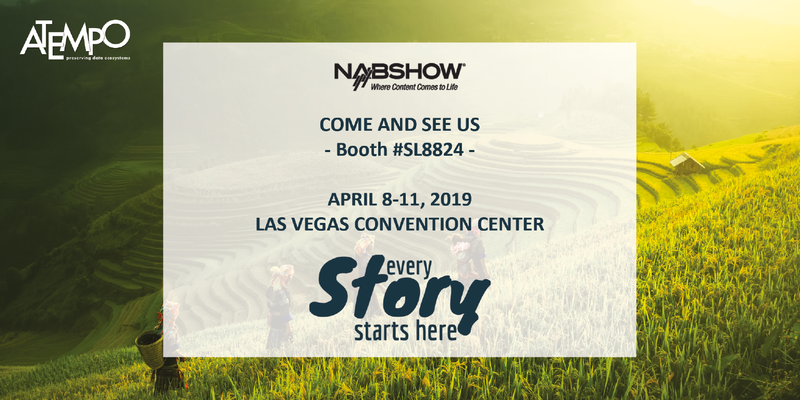 The National Association of Broadcasters Show (NAB) in Las Vegas is the ultimate event for the media, entertainment and technology industry, showcasing ground-breaking innovation and powerful solutions for professionals looking to create, manage and deliver content on any platform. Atempo are on Booth #SL8824 in the Las Vegas Convention Center. See floor plan here.